How did the night end up per the leader board? I would be SO happy if the top two scorers last week were the last two standing – and I think they stand a real chance of that being the case. But I digress. Joe was pretty far down on the bottom, compared even to Bobby and John. 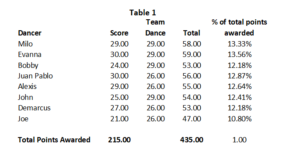 But this is the thing people always forget about two-dance nights – the higher the number of points, the smaller the spread that has to be beaten. So, what did Joe need, vote-wise, in order to be safe? These are NOT big numbers – not at all. 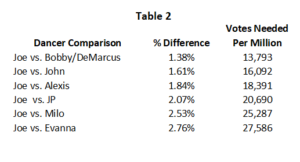 You might say, “but John is right in the demo” (so is Joe, unfortunately) and “DeMarcus is a popular football player”. Well, when you are constantly denigrated by the judges (John and DeMarcus) combined with the likely lower number of votes (giving fanbases more power relative to the average viewer), these things matter less. Whether you like it or not, people have sheep-like tendencies and tend to believe stuff that is repeated over and over and over. I also tend to agree with Courtney that DeMarcus’ dancing suffered once he got hurt. Football players grow up needing to avoid injuries. The mental impact was probably not small. The reasons for Bobby still being around is even more striking. Bobby only needed ONE more vote per million than DeMarcus and 2.3k votes per million to stay over John. This is margin of error territory here folks. And for those of you who think that the showmance is real and don’t understand why many of us roll our eyes and grit our teeth…it obviously works. See below. By any conventional wisdom since this show began, Alexis has been in danger of being eliminated since day one. She stayed over Tinashe likely due to demographics…she continues to stick likely due to showmancing. Not so sure she’ll be so lucky on Monday night. John only needed 2.3k votes per million votes cast to stay over her. A few seasons ago, he would have stayed easily. But, again, the combination of showmancing and the lower number of likely voters means she’s still hanging on. DeMarcus only needed 4.6k more votes per million votes cast to stay over her and he couldn’t manage it. Showmancing works, ya’ll. So, now that John and DeMarcus are gone, your low hanging fruit may finally be in danger. Joe and Bobby, and to a lesser extent Alexis. She’s only low hanging fruit due to her lack of fanbase – she’s not a bad dancer. And, honestly, Bobby has shown some improvement. I just wish he would quit the whining. If the scores remain relatively the same, it could be a very interesting night. Joe would be a good bit below Bobby and Alexis in terms of score, but not out of reach in terms of making up the vote. So who’s fanbase is stronger, Joe’s or Bobby’s?? Alexis is ahead of both of them but she’s in easy striking distance of Bobby (only about 6,100 votes). She’s a bit farther out of reach for Joe (about 25k votes per million). So, a couple things will be tested tomorrow night – Bobby’s real popularity relative to the Bachelor franchise and the strength of the showmance. IMO, either Joe will finally fail or Alexis will be the next one sent home. Why is Bobby safe? Well, if Joe beats Bobby, he probably beats Alexis too AND it’s likely that Bobby beats Alexis because the numbers are so small (6,100 votes). What if they do another double? Well, that’s when we find out who is more popular – Joe or Bobby? Beats the hell out of me. I think Joe is probably more recognizable to the DWTS audience and for some crazy reason they like him. So I give him the edge over Bobby. Finally, much has been made of Evanna being in jeopardy more than once. Of course it’s possible that anyone can be eliminated in this new world of lower viewers (which likely equals lower vote totals). But just like the audience is on to the producers games and how they operate, the producers are on to the FANS and sites like this one. Once upon a time, Jennifer Grey was the only winner in the history of the show to have been in jeopardy. But that was YEARS ago. The producers have learned how to change it up, just like the fans have learned how the producers do things. That makes everything uncertain. But just like lower vote totals make it easier for fanbases to save their favorites, it also makes the judges slightly more relevant. I tend to think our final three are going to be Milo, Evanna and JP. And if those three aren’t the final three, well, this show becomes – finally – only a popularity contest and not a dance competition. Yes…it has always been heavily reliant on popularity or lack thereof. But it will reach new highs (lows?) of popularity only if Evanna, Milo or JP are eliminated tomorrow night. 6 responses to "DWTS Season 27, Week 7 – Dancing by the Numbers Retrospective"
That being said, I really hope both Bobby and Joe would leave, otherwise I wouldn’t mind if it’s Joe and Alexis, as much as I’m not a fan of Bobby. Am I also the only person who’s glad that we only have this week and next week left, and that we only have one show next week instead of two? I like the cast this season, but I’m ready for the season to be over.. I seriously hope Joe and Alexis leave tonight. I was thinking about it, and I’ll take Bobby in the finals over them. Even though he’s been whining since the beginning about anything and everything, he at least wants to be here. Joe just looks so awkward and miserable every week, and I always look at his reaction when he’s announced as safe with the other couples. Not the good kind of “I can’t believe it” expression. As for Alexis, I just want this last minute showmance to backfire in ABC’s face. Just announce she’s on tour already. If her and Milo are on tour together, and they are still pushing the showmance angle, I bet anything we see way more of her and Milo hanging out together than her and Alan. That’s how it seems to be now. But if one of those two have to survive, then I hope Bobby goes. Just get Evanna to the finals! One interesting thing, today they announced more tour dates, with the tour ending March 9th instead of late February. I wonder if this means no spring season or if they will be stupid enough to do a short athletes style season again? So just curious after last night. Since Bobby got through. What does that mean votes wise and how does that affect the final. Should we be scared of a perspective win from Bobby considering he passed the highest scorer of the season. I just don’t know if I can handle that. I’m really of the opinion that it’s milo or evy of bust. I want them both to win so bad. Appreciate these posts so much. I’m taking stats right now so they are extra interesting. DWTS Season 27, Week 8: Who’s Dancing What, And When?